Recently, elsewhere, I have been discussing the contradictions of the Bible. Many are fairly irrelevant in the scheme of things and don’t really invalidate the core claims of the Bible, only the claims of inerrancy. What it does show, however, is the rationalisation process of the average Christian. Not only is the process hilarious to watch, but the answers given vary so widely amongst defenders of inerrancy (and even amongst liberal defenders who instinctively try to protect the Bible's accuracy) that it seems fairly obvious as to the ad hoc nature of the defences. One such example is the use of Gadarenes and Gerasenes which I will look into in more depth in this post and show how bad such attempted harmonisations can be. Most skeptics claim that there is clear contradiction in both of these. The accounts are clearly referring to one single event, so there can’t be two events in nearby places. "Country of the Gergesenes - Mark Mar 5:1 says that he came into the country of the "Gadarenes." This difference is only apparent. "Gadara" was a city not far from the Lake Gennesareth, one of the ten cities that were called "Decapolis." See the notes at Matthew 4:25. 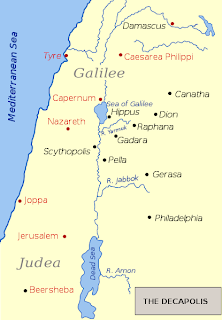 "Gergesa" was a city about 12 miles to the southeast of Gadara, and about 20 miles to the east of the Jordan. There is no contradiction, therefore, in the evangelists. He came into the region in which the two cities were situated, and one evangelist mentioned one, and the other another. It shows that the writers had not agreed to impose on the world; for if they had, they would have mentioned the same city; and it shows. also, they were familiar with the country. No men would have written in this manner but those who were acquainted with the facts. Impostors do not mention places or homes if they can avoid it." This is where theists show fall into exactly the fallacy I keep mentioning - possibiliter ergo probabiliter (possible therefore probable). In fact, I don't even think it is possible. So the classic line is something like this: "They say that he went to the region containing those cities." When they crossed the Solent they got to the country of Liss. The problem here is that you would never say that second option, and this is the strength of taking it out of the ancient context and applying it to a ‘real-life’ example to see what one would actually say. One area can't be two areas. Theists seem to misunderstand that they do not mention a region containing these two towns. This is the common theistic misunderstanding. They mention two town areas. A place cannot be in two town areas. The Portsmouth area is not the Liss area and vice versa (at a push, Liss could be claimed to be in the Portsmouth region, but not the other way round). Furthermore, if you look at the map, only Gadara qualifies as making any sense with the accounts. You cannot sail to the Gerasenes country. Just like Liss sits 12 miles inland from the Solent, and sits behind Portsmouth, you could never alight in Liss, as analogised by the claim. Not only is that nonsensical with the geography of the marine area, but the fact it is BEHIND Portsmouth would mean that the area of the miracle could never be seen as the country of Liss. In the same way, Gereaa was only a village and one would never refer to that area as the area of a small village 12 miles behind the larger Gadara. Some use different reasons still, which itself shows the ad hoc nature of these harmonisations. People come up with anything (they can't all be true) in the hope that it appears to work. So another defence is that it happened in Gerasa but being smaller, some of the evangelists, writing for more distant readers, referred to it instead as the larger town area of Gadara. However, this is clearly not what the Gospels say since there is an immediacy of the time connective and positioning. It is clear Jesus does this miracle upon alighting from the boat, rather than spending at least most of a day walking to Gerasa. Thus that defence fails. As mentioned, the idea that there are multiple ‘answers’ means that there is no clear defence which works. It is proof itself of the weakness of the harmonisations, otherwise all Christians would adhere to the reason which is clearly probable. In the absence of clearly probable reasons, multiple possible reasons arise. One final note on this is included in one of the maps below. To get round this, some maps show a seemingly concocted "Gergesa" right next to the lake, complete with question mark showing the sheer folly of speculation in trying to get the Christian out of a hole (possibly the concotion of Origen as mentioned below). The core of this problem is that the theist sets the probability of a contradiction as impossible in the circular way that I will set out. C) Therefore, there are no contradictions in the Bible. Though (inerrantist) Christians will claim that they don’t do something akin to this, this is clearly what seems to happen. What is amusing is that the best explanation is given by Origen, the early Christian father, who accepted an error - Mark must have got it wrong. He knew it could no better be Gadara than Gerasa. It seems that Gergesa is conflated with Gerasa (hence Gerasenes and not Gergesenes). 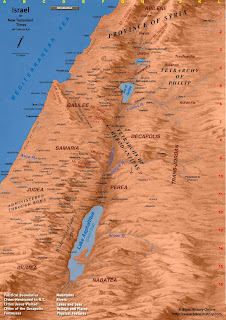 Gerasa is anywhere from 20-50 miles further on from Gadara to the point that Origen claimed that Gerasenes must therefore have been a copyist error (or Mark mishearing) of Gergesenes, which he claims is a town next to the Sea of Galilee. Eusebius later puts in his tuppence by confusing both Gadara and Gergesa and the land of the Girgashites, thus contradicting himself, so not much help can be found with him. What do the copyists do? The best texts of Mark (B and S, with D) have “Gerasenes.” Codex A and Family 13 substitute Matthew’s improvement “Gadarenes.” But the Caesarean text K, doubtless influenced by Origen in his Caesarean period, has “Gergesenes” (!"#$"%&'('). The corrector of S followed suit, along with W and the Family 1 manuscripts. The S corrector made an analogous change in Mt 8:28 (followed, with spelling variants, by Family 1, Family 13, and others). Luke’s Markan reading “Gerasenes” (so P75, B, D) has been assimilated to Matthew’s “Gadarenes” in A, K, F, and Family 13; the Origen correction “Gergesenes” appears in S (original; retained by the corrector) and Family 1. Who was the first to get this right? Surely Origen, and we can give the date: his John commentary was interrupted by his 231 move to Caesarea, and the note on “Gergesenes” (ad Ioann 6:24) follows not long after his complaint about that interruption (6:1). Origen’s etymology of “Gergesa” (as “those who reject,” ad Ioann 10:10) is fanciful; it was the Girgashites (Gen 10:16, Deu 7:1) who were remembered in the name Gergesa. They were long extinct by the time of Jesus. What we have here is an oral error of Mark, who misheard the actual name, and did his best, with limited knowledge of Galilean geography, to produce an intelligible transcript. Who told Mark the story? The story itself, as has been remarked, is near to folktale, and probably reflects popular Christianity. So do many miracle stories in Mark, for all of which Peter is a possible informant (and sometimes, one of three possible informants). The implication is that Mark is here drawing on popular legends, but legends heard once only. The authority then is primarily that of the testimony of Origen himself. 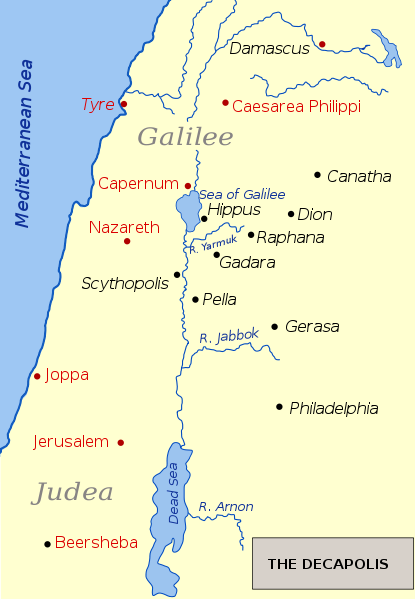 He knew of but two readings: Gerasenes in most copies, and Gadarenes in a few others; and rejected both because of the geographical impossibility of either the southern Gerasa of the Decapolis, or the northern Gadara of the same Greek territory, respectively thirty and six miles southeast of the sea. The identification of its people with the Girgashites of Gen. 15 21- known to us only in western Palestine--and consequent designation of it as an "old city," point to this connection with the Old Testament as a chief reason for his preference of Gergesa. Josephus says that the name Girgashites had disappeared without leaving traces. Not that Origen tried wilfully to falsify; but he regarded the other names as corrupted, and this occurred to him as the probable original reading, the more so because he found in Gergesa the allegorical meaning of "habitation of those that have driven away." Then, as is the case with so many travelers, the natives gave him the answer that he wanted upon his putting a leading question to them; and, under the influence of this suggestion and the reports of it that spread abroad, adopted it as a local tradition. There is then a strong probability that the only real evidence for a town Gergesa springs from Origen, and that he derived the name from a conjectural connection with the Old Testament and allegory. It is worth checking this piece out because Clapp also gives textual and geographical reasons as to why Origen devised Gergesa as a harmonisation. What this leaves us with is either Origen is right, in which case Mark is wrong, or Origen is wrong, and the Gospels really do disagree, and the places they disagree on have huge geographical issues for being where Jesus alighted and where he managed to drown 2000 swine, driving them off a cliff and into the water. If there were two of them, there was at least one, wasn't there? Mark and Luke center attention on the more prominent and outspoken of the two, the one whose demonic occupants called themselves "Legion" (Encyclopedia of Bible Difficulties, p. 325). This is ridiculous because no two claimed numbers that are different can ever be a contradiction because one number is always smaller than the other, and is thus claimed to be a subset of another. If I said I played football against a team of 10 men the other day (when there should be eleven), you would claim, "that's OK, you obviously meant 11 men since 11 men includes 10 men. Just because you said 10 doesn't mean there weren't 11!" So why would they leave one man out? Three responses come to the fore. 1. The first is a theory that Matthew here (and elsewhere) doubles to fit the criteria of "two witnesses". However, Matthew does not double characters consistently enough for this to make a worthwhile explanation [Keener, 282]. It also doesn't make a lot of sense because Matthew already has at least a dozen witnesses present in the form of Jesus and his disciples. As Holding himself claims, this is not consistent enough to be a worthwhile defence. I will leave it at that. Remember, if there are multiple theories for doing something, then it usually means most theories are wrong. This is the least probable of the three Holding mentions. 2. A second idea is that Matthew, copying Mark, has followed a normal literary procedure for the day, in that he has left out other accounts by Mark (1:23-6 of the demoniac; also the blind man of 8:22-26) and so has chronologically displaced them, quite intentionally. Of course we do not agree that Matthew copied Mark, at least not in his original Aramaic edition; but the same process could conceivably have taken place using common oral tradition or an Aramaic original. This is another incoherent attempt at harmonising. There are not two distinct events involving single demoniacs. This is one event involving two demoniacs. This thesis, by Holding’s own language, is only as good as “could conceivably” – itself a hugely unlikely probability. I would say it is less likely than that. The language is clear and concise. One has to really gerrymander in order to maintain inerrancy here. 3. The third idea is simply practical: the second guy didn't do much, or as much. While the one guy came forth yelling and saying Legion and all that, the other probably hung back in the bushes yelling and physically cowering. We don't know exactly what happened, but the bottom line is that if he didn't do anything special, and Mark and Luke are emphasizing action, they aren't going to divert from the main story and tell all about the guy hiding in the bushes that had to be called out or chased down, and change their whole story to accommodate him. We can see an actual example of this within Luke's Gospel. Wright in The Resurrection of the Son of God  notes within Luke the example of how Peter is reported only to have gone to the tomb, yet on the Emmaus Road the disciples say that "some of our number" went to the tomb. Clearly, "Luke is quite capable of highlighting one person when he knows, and tell us later, that more than one was involved....If Luke can say that there was one person, and then later that there was more than one, the numerical differences between the different accounts of the women and the angels cannot be regarded as serious historical problems." Obviously this would apply to the demoniac story as well. Wow, they really are inventive. One account says two demoniacs, another says only one, so the account that mentions only one was really talking about two but since one of the demoniacs only hung round in the background not doing much, he only mentions one. Not accurate history at all. This is not “diverting from the main story” by mentioning two since in Matthew, when he mentions two, there is no diverting. One is perfectly capable of mentioning two without there being a distraction! So this falls down on merely looking at Matthew. Another example of ad hoc improbability. Highlighting Luke and the Road to Emmaus does not get Luke off the hook, but merely sends him deeper into examples of inaccuracy! And even if the Road to Emmaus example stands, the language is different and more vague. Matthew says two, Luke and Mark say one. Rather explicitly. I love the “obviously” thrown in as a rhetorical device. It’s not obvious at all. Again we have a misuse of language in this false analogy. Names are not synonymous with numbers. If I say in a news report "One person was shot yesterday at a bank robbery" that does not leave the possibility that I could mean "Two people were shot yesterday in a bank robbery". This is simply a bastardisation of the English language and does not stand up to any kind of scrutiny. I would simply be wrong in my first claim. So what can we learn from this? Well, the implications of this particular contradiction aren’t really relevant. What is relevant to me is how the mind of the committed and conservative Christian works; how they rationalise things which ordinarily they themselves would find ad hoc and highly improbable. I would be interested to see how charitably they treat the contradictions of the Qu’ran. And it is no good to say they have other evidence that they can rely on that allows them to think that the Bible deserves more charity and that it is essentially inerrant, since the Bible is the key source of most opinion about the Bible, which makes it circular, or they rely on personal revelation. The same sort we hear from all religions, often concerning their religious texts. Really, we must take these claims from a sort of Bayesian position such that the prior probability of holy books, or indeed any text, having mistakes is high, and that the evidence for a harmonisation of these contradictions is poor (requiring the usage of language that is, quite frankly, bizarre). Thus, in all probability, the idea that the Bible (in this case) is inerrant and has no contradiction(s) is incredibly implausible.